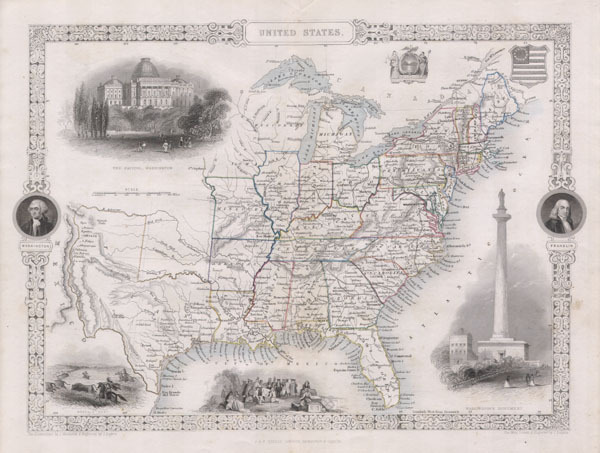 This is John Tallis's highly desirable 1850 Map of the United States. This is the earliest variation on this map that includes Texas as a state. Herein Texas is depicted at near its fullest extent including both Santa Fe and but excluding the Green Mountain extension in the Northwest. Wisconsin and Iowa are shown with amorphous boundaries. Offers several beautiful vignettes depicting the Baltimore Washington Monument, The Capitol in Washington D.C., Penn's Treaty with the Indians, and an American Indian Buffalo Hunt on the Great Plains. The upper right quadrant features a U.S. flag shield and an Excelsior seal. The ornate border includes the portraits of Washington and Franklin. Undated, but the form of Texas allows us to positively date this to the early 1850 issue of Tallis's valuable map.